Marsha Meyer has been directing the Judy Sare Preschool and Camp Simcha for 27 years. She and her husband Marlon have lived here in Bensalem for 38 years. They have 3 adult sons 3 granddaughters and 1 grandson. Her boys all attended Hebrew school through confirmation here at TI and her 2 younger sons attended preschool here as well. Marsha attended Penn State and Temple University where she received my BA in Education as well as post graduate classes in special Ed and School Administration. 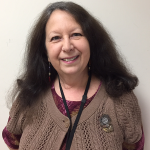 In her free time, Marsha likes to read, do crossword puzzles but mostly spend time with family and friends. We are very hamish here at Judy Sare. Many of our teachers have had their own children here and now have grandchildren in our preschool and I love that we have parents, and staff who were once children in our preschool themselves!